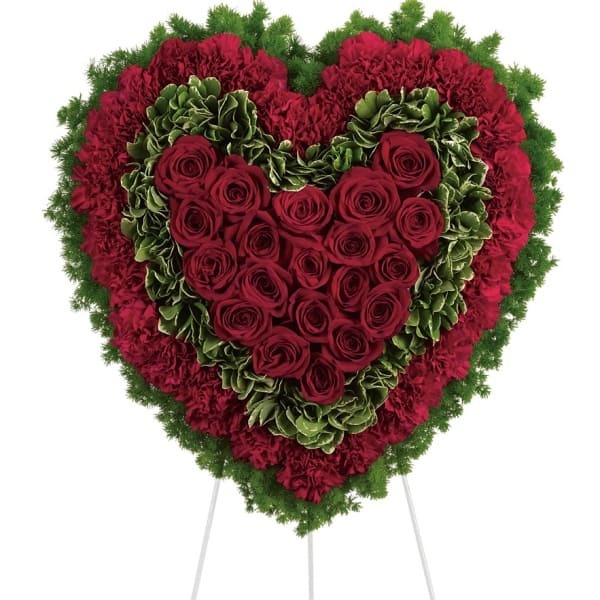 Remember a loved one's generous heart with this red arrangement in a classic heart shape, a declaration of eternal love and devotion. 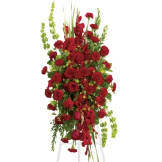 • Solid red roses matched with deep red carnations are surrounded by variegated greens and fern. 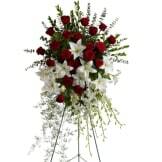 • Arrangement measures approximately 21" W X 21" H.
Flowers will be received by a Kamienski Funeral Homes, Inc's staff. I was very pleased with this arrangement, I asked for one particular flower to be added, and it was done very nicely. Really great customer service, I w use them again if the need arises. I can't seem to get the stars to come up on the review, but I would give maximum stars. 100% satisfied. 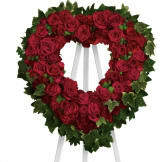 Beautiful piece and local floral did a great job in putting the ribbon across the wreath as it's very visible. Only thing is the gift message was not in the card, otherwise everything is perfect. All of our flowers are designed and delivered by hand from a local florist in in Wallington.